On a day when I thought I had no food in the house, this recipe was born. I’d never attempted a fish recipe before because admittedly, I am NOT a fish person. Historically, the only fish I’ve ever really liked is smoked salmon, and even then it had to be accompanied with loads of cream cheese, capers, red onion, dill, and lemon juice. SO, when I came up with this recipe it was a pretty big shock at how amazing it is. I think it’s probably the new house favourite. It was so good that I had seconds. Everyone had seconds – even the kids. I would go so far as to say that this is probably my new favourite dinner recipe, so if you’re reading these words I kindly ask you to make it asap and report back here! Place two large pieces of tin foil side by side on a baking sheet and fold them together accordion style so they make one large piece of tin foil. Chop up the onion and garlic and toss it in a large bowl along with the diced tomatoes (including the juice). If you have coriander and fennel seeds, place them in a coffee grinder and grind until fine. I like to grind my seeds myself so they are fresh and aromatic. I find buying seeds in their powdered form don’t have quite as much flavour. Add the fennel, coriander, paprika, cumin, salt, and pepper to the tomato mixture and stir well. Spoon 1/4 of the tomato mixture onto the middle of the tin foil and place the salmon on top, pink side up. 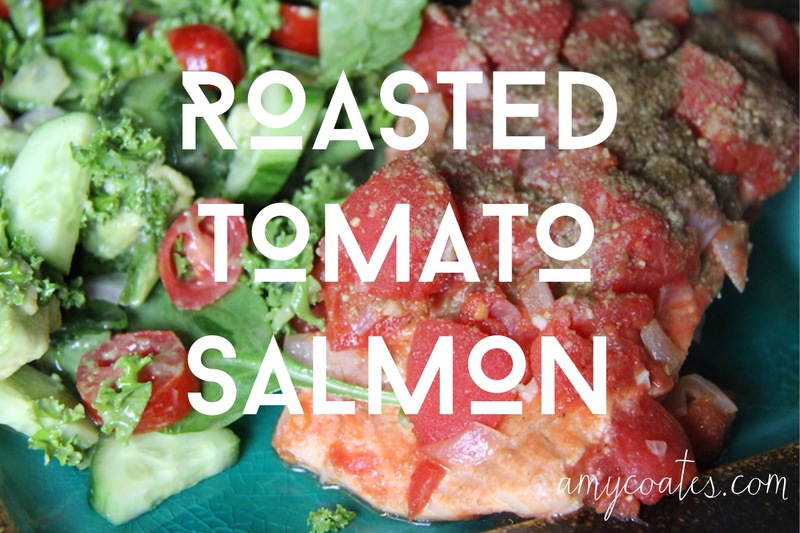 Spoon the rest of the tomato mixture over the salmon and then fold the foil together on top followed by the sides so that it is airtight. Place in the oven and cook for 25 minutes at 400 F.
When you take the salmon out of the oven, the salmon should be slightly pink/raw in the middle. This is exactly what you want. Let it sit and rest for 5-10 minutes so it can rest/finish cooking and then enjoy!